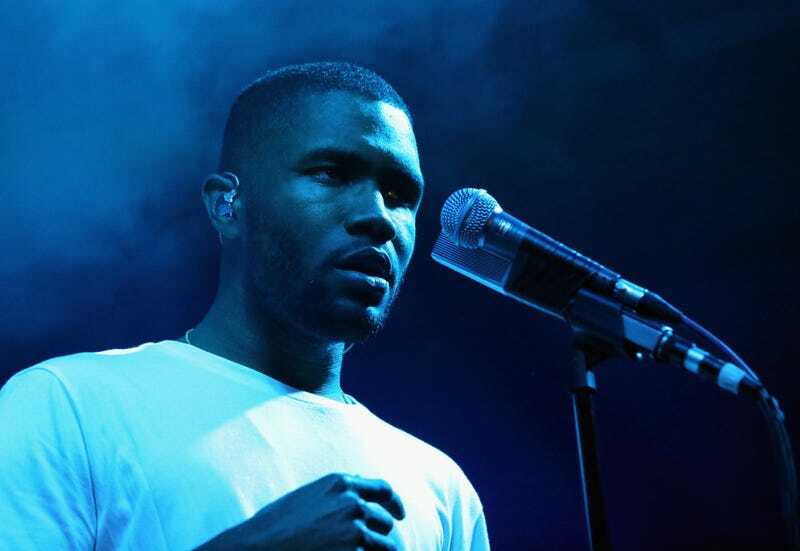 I do not believe that the extremely good musician Frank Ocean will release his album today. Our paper of record did, based on an insider with knowledge of Ocean’s deal with Apple, but they’re going to look silly, just like all of us. How could we be so gullible? Here’s an image he presents on the album’s official site; why would this track record inspire any confidence? The safest prediction to make is that AUG 5 2016 will become just another inky stamp, filling out that last row of space. Where, after all, is Frank Ocean? His outro on Kanye’s “Wolves”—some of my favorite 30 seconds of music this year, sparse and sad—sound like they were recorded on GarageBand in a cave by some musical bear ready to settle into another winter’s hibernation. He emerged to attend Kanye’s album release at Madison Square Garden, but probably went right back after. And now the people are clamoring for him, for his sweet, sweet music, and he can’t hear them from inside his cave. All this clamor has, inevitably, found its backlash. Some Frank Ocean stans assume the high ground over their fellow stans, solemnly intoning, with wagging Twitter fingers: “Frank Ocean doesn’t owe you anything.” It’s true! He is a meticulous, sensitive songwriter who is free to release his art at any rate he wishes; he is no captive to our selfish desires for dank tunes. But it’s also true that people get justifiably frustrated when other people break promises. If you’re like me, that might be reason enough to find another hero. One artist who has upheld all his promises to me is Matisyahu. When Matisyahu said he would perform at the humble venue in my hometown, he lounged on the speaker with his leg dangling off, looking impossibly cool. When Matisyahu said he would show the crowd a great time, he got the edgy neighborhood teens doing weed and putting their lighters in the air (the first and last time I have seen anyone doing weed). When Matisyahu openly grappled with his faith, he showed young Jews like my friend Rafi how to “forge his own path.” When, earlier this week, a blond, long-haired, clean-shaven Matisyahu heard a busker singing his own iconic jam, he crooned along until quietly revealing his identity and inviting the fan to a show. And when Matisyahu wants to inspire you, he’ll deliver the second-best song of every summer. My editor Puja blasphemed this song as “rly bad” and suggested a classic Bob Marley cut in its stead. (How original, Puja.) But she’s lying to herself. Don’t act like this song doesn’t rile you up to “take a stand.” Unshackle yourself from your reliance on the delinquent Ocean, raise your smartphone to the sky, and surf the spiritual vibes of Matisyahu.